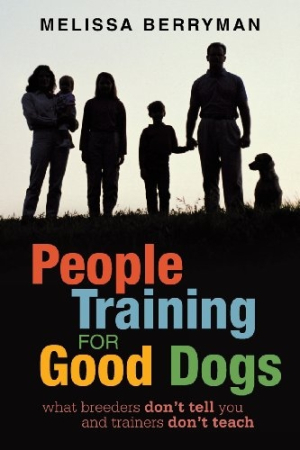 In People Training for Good Dogs, former Massachusetts animal control officer Melissa Berryman presents a no-nonsense guide to what dog owners must know in order to develop the skills they need to successfully handle their dogs. Simply being a human is not enough to ensure being the one in control. Berryman says that six years on the job disabused her of many common misconceptions about dogs and their behavior. Since leaving that job, she has worked with more than ten thousand dogs and their owners, as well as with rescue groups and communities, sharing her insights into canine behavior and teaching essential training skills to people. Dogs, she claims, are neither “good” nor “bad”; it is how people interact with them that influences their behavior. An understanding of “natural” canine behavior is essential to following Berryman’s program. All romantic notions fall to the wayside as she explains the basics of pack-animal hierarchies, emphasizing that dogs require that hierarchy. She also encourages people to remember that dogs do not have human intuition and are not like children. While perhaps disillusioning to many, her straightforward discussions of canine instinct and “sound predation ecology (how predators act in their natural environments)” show how society in general misunderstands canine behavior. She disputes much of what people think they know about dogs, claiming that most of it is, at best, misleading or, more often, completely false. Nothing is sacred; she challenges everything from breed-specific traits and temperament to the reasons dogs appear territorial and the best way to approach an unfamiliar dog. Fallacies abound, she claims, and she shatters them rather thoroughly. According to Berryman, projecting personality traits by breed is no different from stereotyping people by race and ethnicity. She points out that no matter what the breed, in the wild, only “leader” canines reproduce, and easygoing pack members—those in the lower ranks—do not. Trying to selectively breed lower-ranking dogs in order to produce more dogs of similar temperament simply does not work. The pack hierarchy is an integral part of canine existence, and no amount of human interference can change it. Clearly written, and repetitive where it needs to be, People Training for Good Dogs is not the average “sit, stay, speak, roll over” manual for training dogs. Berryman’s approach is deeper, and her goal is broader. She teaches owners how to gain confidence and control over their dogs, how to solve problems, and how to avoid serious safety and liability issues. The book includes two basic questionnaires to help owners identify problem areas and understand where they need to focus in learning how to better handle their dogs. Browsing through the questionnaires before reading the book will give owners an idea of what to expect from Berryman’s instruction. Her ideas challenge what most owners have heard and learned before, but her arguments make sense. Anyone who now has a dog or is contemplating getting one will benefit from reading this book. Anyone who owns a “problem” dog needs to read it right away.